I love church cookbooks. You know the ones I mean. They have all the best recipes the women in a church prepare. 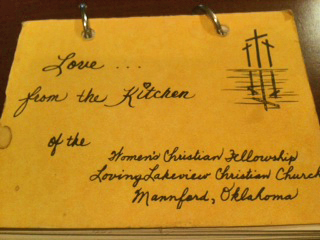 When I was in Pryor Creek, one woman did most of the cooking for funeral dinners by herself. Joy (the perfect name for her) was what I call a master chef. To be truthful, at that time I was a working mom with three very active boys. 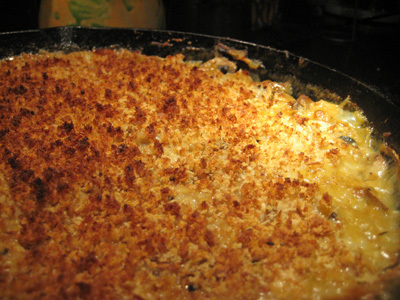 I learned to cook from my mom, who had six kids and cooked a lot of fast and easy recipes. Spaghetti sauce from a mix, taco sauce from an envelope and pizza dough from Bisquick. I probably deemed anyone who made her own Alfredo sauce instead of pouring it out of a jar a master chef, but Joy truly was fantastic. So the other day when Joy commented on Facebook that she was making my recipe for Chicken and Rice, and that it’s THE BEST, I nearly cried with happiness! 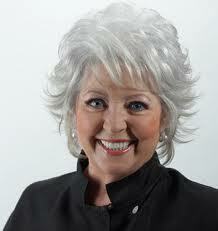 I couldn’t have been happier if Paula Deen had bragged on my recipe. But it’s really not my recipe. It’s Eunice Posten’s and I got it from this cookbook. Bake in the oven at 400 degrees for 50 to 60 minutes or until breasts are done. Rather than topping with chicken breasts, sometimes I take small pieces of breast meat (such as for fajitas but cut into bite size pieces) and stir them into the rice mixture and cook as above. Everyone in my family loves this dish. It’s a golden tan color when you take it from the oven, and right around the edges is the best crunchy goodness! Yuuuuuum . . . .
Like my grandad used to say, it’ll make your tongues lap your brains out! Try it and let me know what you think! Categories: Small World Recipes | Tags: Broth, Chicken, Chicken Breasts (Great Taste Low Fat), Cooking, Cream of mushroom soup, Facebook, Paula Deen, Recipe | Permalink. Sounds delicious! I like the idea of mixing in bite-sized pieces. I’ll add this one to my menu next time I go grocery-shopping. I should have fixed it for you sometime. I don’t know why I haven’t. I’m going to post your ribs sometime. Like most of what you make they’re the best. It really is good, Roseanne. You make a lot or a little very easily. Yuuuum. Looks like I’ll be making this delicious dish this week! I’ll let you know what we think. Thanks for the recipe, Aunt SuSu. Grandmommie found it first. I mostly cook like she did. I hope really enjoy it. Oh Susan you are too kind!!! I am truly touched by your compliments, I guess that is how life works out when you are doing what you want, like and are called by God to do. I don’t think most women give themselves enough credit when it comes to cooking and cleaning. Most of you are trying to live up to the way that most of your moms did it, BUT (you know what Dr Phil says BUT means, “now I’m going to tell you what I really think”) FULL TIME homemakers. You ladies are trying to cook and clean like a full time homemaker on a part time clock!! The other secret to their success was BUTTER! Your memory serves you well, as far as the Chicken and Rice recipe, I don’t know about the other areas of your life. LOL! The notation I have next to my recipe is to cut the BUTTER in half and double the rice mixture. Yum, it makes me want to fix it this weekend! Speaking of the SS cookbook, the cover is lite blue and pink with baby/cooking angles fluttering around a center angle that is singing, now get a visual on that!!! The name is Heavenly Delights, Ladies Care and Share Fellowship Pryor, Ok. I will say mine is no longer held together with a binding but now it has a big clip, speaks well of the good recipes inside. It is so nice to see your face on my FB, it always brings back good memories! Not to mention living in your home! I’m not very computer literate but I will try to put a picture on my FB page of the new view from the den, Paul and Tim D’s put in a huge picture window on the South facing wall, it has changed this room completely, and as you know the views out here are fabulous!!! It was truly a lifesaver when we had those ice storms last year, we were without electricity for a week and the sunshine coming in from that window was a blessing in so many ways! The truth is, I wanted my kids to have a life like I did growing up. I couldn’t be home full time, but at least they could eat like I did. And have a church home like I did. That was very important to me! Thanks for your friendship. I still treasure so many of my friends in Pryor Creek and miss y’all alot! I remember Mama coming out to LA and making this. Our memories are certainly tied in with food, in a good way. Joy was so very right! We still try, though, don’t we? Mama was a wonderful cook and homemaker, even after she opened the dress shop. And our memories are built around food. You can tell by looking at Aunt Betty. Poor Aunt Betty. She gets such a bum rap! double snork! Gotta blog about Aunt Betty one of these days.